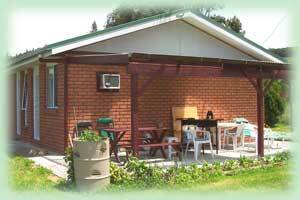 Quamby Pines Chalet is located in a beautiful valley near Deloraine. It comprises a self-catering 2 bedroom Chalet with Kitchen and a self-contained double bedroom. 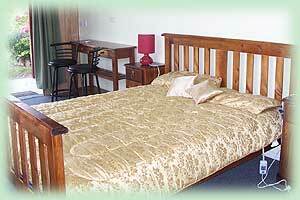 The CHALET sleeps 5 and UNIT2 sleeps 2 persons. 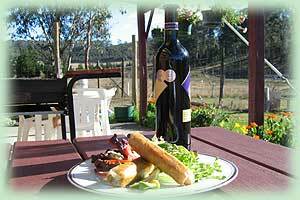 All this is on a well balanced chemical free 40 acres with 5 acres of Bush land accommodating a variety of wildlife, this includes Wallabies, Potteroos, Tasmanian Devils our semi wild Deer and more. There is also 4 acre of dam stocked with Rainbow Trout and not to be forgetting a pair of Platypuses. You will love the 1 acre of garden with plenty of roses and a small orchard containing Apple, Pear and Nut Trees that surrounds your accommodation. There is also a few grape vines growing, mainly as a feed for the many and varied Birds using it as their B&B. The rest of the land is for our Miniature Herefords to spoil themselves in the lush Pasture. UNIT 2 includes your own entry to the self-contained B & B and your own private outside sitting area. Inside UNIT 2 is your Queen bed, TV, fridge, Tea & Coffee making facilities and Shower/ Toilet. *** 7 Nights Special *** Book 6 nights or more and receive the 7th night free! The Chalet is a self contained, self catering B & B accommodation suitable for a family and can sleep up to seven people. This is your main bed/lounge area, containing Queensize bed and a foldout double sofa bed. The second bedroom includes a double bed and a top bunk bed. Kids love it! The Kitchen is fully equipped with a fridge, small oven and hotplate plus a microwave. The rates per couple per night is $110, each extra person is $20, or $15 per Child per night payable on arrival. *** 7 Nights Special *** Book 6 nights or more and receive the 7th night free!